First published by Fraktura in Croatian as Elijahova stolica in 2006. English language translation by Ellen Elias-Bursac published by AmazonCrossing in 2017. In this gripping, war-torn epic novel, author Igor Štiks, a nominee for the IMPAC Dublin Award, tells the story of a celebrated writer who travels to Sarajevo to unearth devastating family secrets and the lies that have defined his life. 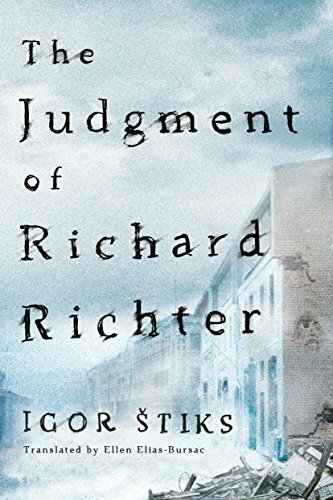 At the beginning, The Judgment Of Richard Richter felt like quite an old-fashioned literary novel in style. It is narrated by a recently divorced man, the eponymous Richard Richter, in his fifties who is uncomfortably aware of both his age and his situation, and I thought that generally the slower style fitted this character. He repeatedly just happens to mention his literary success and fame, but this man has returned to live in his childhood home - and unchanged childhood room - so a lot of his speech must be to bolster his own ego as well as an attempt to impress his fictional and actual readers. Richter's self-absorption reminded me of reading Wasp Days and initially I wasn't sure I would enjoy the book at all. The repeated foreshadowing of impending doom felt far too heavy-handed a device. We know from practically the first page that this novel isn't leading to a Happily Ever After so I could have done without so many 'by then I would know that ...' musings. That said, I did love that this feels like a very European novel. The destruction of Sarajevo provides a dramatic backdrop running in parallel with the destruction of Richter's sense of his own identity. Descriptions of broken streets echoed those in the amazing novel The Cellist Of Sarajevo and the extents to which people go to try and maintain hope in wartime are astounding. I loved the idea of the theatre troupe and I imagine this novel has a lot in common with their Max Frisch Homo Faber play - I must now read that novel in order to find out. Stiks also cleverly draws in Laertes reunion with Odysseus, reminding me I am yet to read my copy of The Odyssey! The main theme here is identity, both individually and culturally. 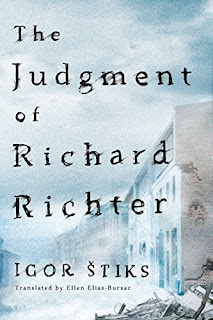 In the cultural melting pot of Sarajevo, Richter begins to understand the truth about himself, and must then try to deal with the repercussions of that truth. I don't want to discuss too much more as going in to this novel unawares worked brilliantly for me. The Judgment isn't so much about the revelation as about Richter's journey to and past that point. The novel speeds up its pace considerably in the second half to become an exciting read, albeit one that takes a decidedly uncomfortable route. it would be interesting to find a secret notebook or diary of a deceased relative. Yes, especially if it totally rewrote everything you believed about yourself! Yup with foreshadowing often less is more. I like the parallels between the destruction of the setting and of the sense of identity! Clever! Some of The Judgement is perfectly pitched and beautifully powerful writing - and then he goes and plonks in a hamfisted foreshadow!! That "by then I would know that ..." type of foreshadowing does get really tiresome and is almost always heavy-handed. Glad the rest was pretty good though! Sometimes uncomfortable can be thought-provoking at least.